With a sharp knife, make a cut along the inside curve of each frozen banana, being careful not to cut all the way through. Open slit to form pocket. Melt the chocolate chips in the microwave at 30-second intervals until smooth. 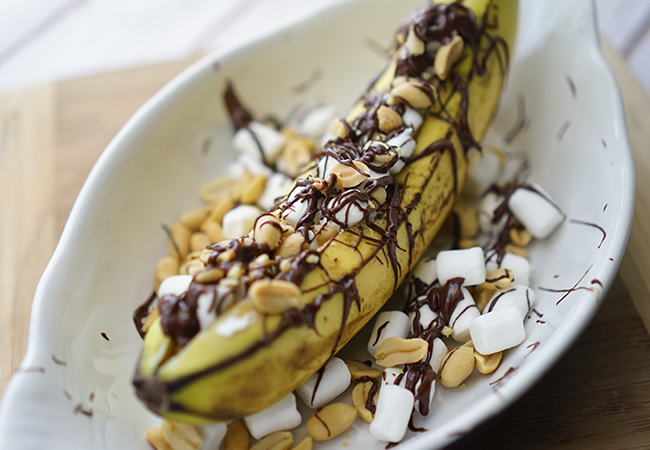 Fill each banana pocket with 2 tablespoons of marshmallows and about 1/2 tablespoon of peanuts. Drizzle melted chocolate chips over banana and dig in!